Is there a systematic way to make your child world class? TechnoparkToday.com>> What are the ways to create innovators and world-class leaders? Is there a systematic way to develop these leaders? These are few of the questions, the founders of Greenvalley International School (www.greenvalleyschools.in) asked, 7 years ago. After researches and discussions, experts from different fields, the finest minds of the country put their minds together and developed one of the scalable school systems, an education which would rival, schools of the wealthiest nations. It is incredible to watch learners doing their work, may it be writing, experimenting, researching, exploring and observing without the presence of the facilitator. They have the freedom to approach the facilitator anytime to get assistance and guidance. Learners are self-driven and they have a plan. Their daily plan is created, implemented and reflected by the learner which teaches the skill of plan, do, review, which is essential in every phase of a child who is heading towards becoming an innovator or a world-class leader. Apart from the regular school meetings and activities, free parenting workshops, one to one parent interactions, expert advice, guidelines for bringing the best in your child are provided at this school periodically. 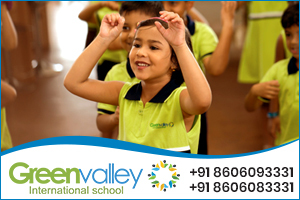 Greenvalley International School has also made as its mission to share many best practices and child development guidelines, which are all easy to practice in the home environment. Please Whatsapp to (8606083331) your child’s name and age, to get age-specific free materials, activity books and an invitation for hands-on parenting workshops.